The ultimate guide to Maria Alm ski holidays in 2019 & 2020. A gorgeous Austrian village, linked with two others to form the Hochkönig ski area, and 24 others to form the ginormous Ski Amadé. Kids are treated like kings, and there’s tons to do on and off the mountain. One of the three resorts in the Hochkönig ski area (besides Dienten and Mühlbach), Maria Alm’s surrounded by the rugged peaks of the Steinernes Meer, Hochkönig, and Pinzgau grass mountains. The village itself is beautiful too, with olde worlde buildings gathered around a tall church spire (the highest in all Salzburg), and rolling meadows dotted with mountain huts. It’s a place of close-knit residents, who come together to honour age old traditions and customs – harvest festival and advent are two of the biggest events of the year. Accommodation is spread between hotels, apartments and farmhouses – the best being both in the middle of the village and within a couple of minutes’ walk from the lifts. Getting here’s easy – Salzburg Airport’s just over an hour’s drive away and the nearest train stations are Saalfelden (10 mins away) and Bischofshofen (45 mins away). Families are welcomed with open arms in Maria Alm - lift pass offers, specialised ski areas and exciting activities are the norm in this neck of the woods. The Hochkönig pass covers 120km of runs, but for even more skiing you’re also part of the Ski Amadé area, which includes 25 villages and 760km of ski slopes, including those on the Dachstein glacier. View our detailed Maria Alm snow forecast or snow report and see all live webcams, piste maps, road and travel maps and lift pass prices. For a picture of historic snow conditions see the snow depths month by month with our Maria Alm snow history. FIS ski teams train here, to give you an idea of the standard of ski area you can expect in Maria Alm and the Hochkönig ski area. Drag lifts serve gentle beginner runs near the village base, with longer blues and reds to progress onto further up the mountain. Maria Alm is one of the best starting points for skiing the Königstour, a 32km circuit of the best red and blue pistes that covers five summits, three towns and a whopping 6700m of vertical. The whole thing is signposted with orange or yellow arrows. Experts can conquer the runs from Aberg-Langeck, where there’s a mix of reds, blacks and freeride terrain including the Grießbachhütte, Schreinerloch and Perme ski routes (marked and avalanche checked, but not groomed). Guides from the likes of Markus Hirnböck Alpine Ski School will be able to show you the area’s hidden powder spots, providing safety training and equipment if needed. Freestylers have three snowparks including the BlueTomatoKingsPark over in Mühlbach. The Natrun Beginners Park (near the village by the Simmerlift) has small features for first time freestylers, who can practice on a wave run, two boxes and a jump. There’s also Aberg’s Schönanger Funslope for littl‘uns. The area has 30km of cross country trails. If you’ve covered the Hochkönig area, upgrade to the Ski Amadé pass which covers five regions and an enormous 760km pistes. Maria Alm has more après bars than the other villages in the area, but even so you won't find huge parties and loud music. Der Bachwirt and Dengl Alm are the most popular spots, where the atmosphere is friendly and relaxing. The Hochkönig is the only certified vegan region in Austria, welcoming veggies and vegans with open arms – we’ve found terrific menus in the Steinbockalm, Tischlerhütte und Wastlalm ski huts. Wine lovers should head to the Wiesenstadl, where food and wine are paired perfectly. If you’re a sucker for a good view, head to one of the region’s ‘Sundowner’ ski huts which combine good food and a relaxed atmosphere with fabulous views of the sunset, followed by a tochlit tour back down the piste. Last time we checked, this was available in Abergalm and Bärmooshütte. Our favourite evening activities include the floodlit toboggan runs and the night shows on Tuesdays by the Simmerl lift. When is the best time to ski Maria Alm? This isn’t the highest ski area in the alps, but an impressing 92% of the ski area is covered by snowmaking and thanks to the Ski Amadé pass there’s always access to snow sure skiing on the Dachstein glacier. The ski area is usually open from the beginning of December until the middle of April, though in the last weeks of the season often some lifts and slopes aren’t operating due to the spring conditions. Advent tends to be a spectacular build up to Christmas in Maria Alm, with concerts, a Christmas market and beautiful light displays creating a festive atmosphere. The early morning ski sessions have been one of our favourite things about February Half Term in Maria Alm over previous years. The Easter Bunny usually scatters baskets of eggs along the Königstour during Easter in Maria Alm. In previous ski seasons, under sixes could ski for free in Maria Alm (and under 15’s over Easter), making it a great value destination for young families – hopefully the offer will continue! Even without the deals and discounts, there are oodles of offerings for children from the Schneewutzel kid's club to the Guest Kindergarten for tots too small to ski. 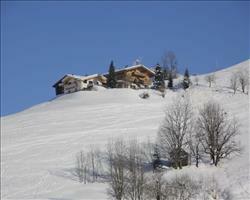 120km of skiing in the local area alone, with hundreds more pistes in the wider Ski Amadé. And that’s just the ski area – friendly bars, fun evening activities and a cosy village to call home make this a brilliant base for group ski holidays.